Pit Boss made a big splash in the barbecue scene when they went after Traeger by selling low cost their pellet grills (see Pit Boss vs Traeger for details). It now looks like they are going after Masterbuilt by selling low cost electric smokers. 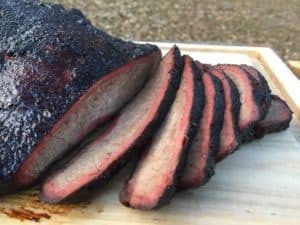 I wanted to share the limited information I have on this new product line so I put together this Pit Boss Electric Smoker review. 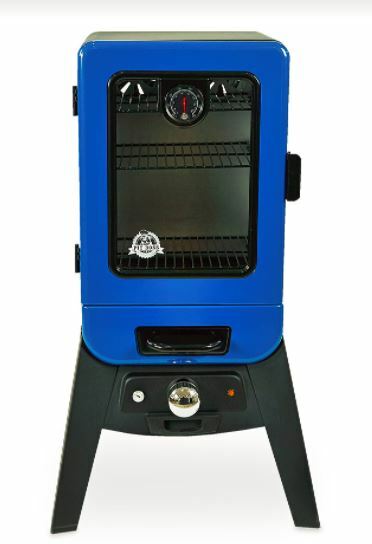 There are two versions of the Blue Blazing analog electric smoker, the 2 Series and the 3 Series. The only difference between the two smokers is that the 2 Series has three cooking grids while the taller 3 Series has four. The respective cooking area is 593 versus 791 square inches. The MSRP on the Blue Blazing Series 2 is $199. The MSRP on the Blue Blazing Series 3 is $229. These smokers are powered by a 1500 watt heating element that lets these cookers operate between 150F and 325F. There is a water tray inside the main cooking chamber and a tray for wood chips that slides out for easy refilling while you are smoking. The biggest feature to understand about these smokers is that they have an analog control system which means you will have to spend some time learning how to dial in the temperature you want. 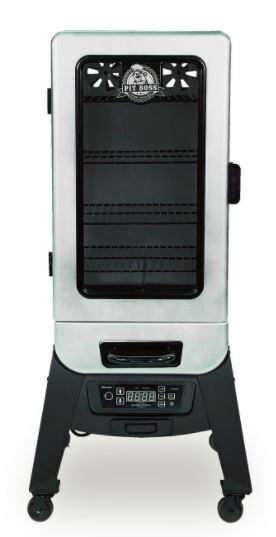 There are two versions of the Silver Star digital electric smoker, the 2 Series and the 3 Series. The only difference between the two smokers is that the 2 Series has three cooking grids while the taller 3 Series has four. The respective cooking area is 593 versus 791 square inches. The MSRP on the Blue Blazing Series 2 is $239. The MSRP on the Blue Blazing Series 3 is $269. These smokers are powered by a 1650 watt heating element that lets these cookers operate between 100F and 400F. The Silver Star smokers have a digital control panel that makes it easy to set the desired cooking temperature. Masterbuilt electric smokers get great reviews and have a long track record of performance. The feature that Pit Boss is using to differentiate itself is the ability to cook at higher temperatures. Masterbuilt electric smokers top out in the 250F-275F range. While this range is perfectly fine for smoking ribs and brisket it is too low for crisping up chicken skin. The Pit Boss Electric smokers claim an upper range of 325F to 400F. If it can really obtain those temps then crispy chicken out to be easy to obtain. The price on both brands keeps jumping all over the place so figuring out the best value is going to be a day by day judgement call. Both brands come with a one year warranty.